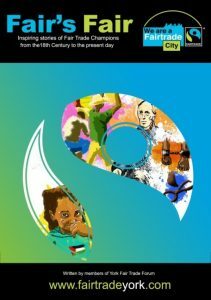 An exciting new book has been published by York Fair Trade Forum. Edited by experienced educationalists, it is suitable for use in the classroom or by youth groups. Every Fair Trade group should have a copy (or several). We all depend on people and countries from far and near for the things we use and eat every day. What we buy affects the lives of the people who grow, produce and make what we buy. So, many of us buy fair traded, or ‘Fairtrade’ goods, which give those who produce them a fair price and better working conditions. There is a long history, in many different countries of people who have helped to improve the lives of producers by selling only goods which had been fairly produced. Read about just 10 of these courageous and visionary ‘champions’ in this book. The fairandfunky Fairtrade Football Fun Day welcomed Primary Schools from across Kirklees to Honley High School for an afternoon of football and Fairtrade focussed games, activities and co-operative learning. All fairandfunky workshops encourage participants to look at the world around them and empower people of all ages with the knowledge that their actions can make a difference. This event focussed on Fairtrade, and students discovered throughout the event that you can make a difference with Fairtrade even as you play football! Fairtrade guarantees a fair price is paid to farmers. But how can a football be Fairtrade? It doesn’t grow on a farm?! Workshops led by fairandfunky enabled students to meet the people in Pakistan who make Fairtrade footballs for Bala Sports UK. They discovered that over 700 stitches go in to 1 football, and that the balls are stitched by hand, taking 4 hours to make. Students discovered the difference Fairtrade has made to communities; with Fairtrade premiums being invested in water sanitation and free eye tests. Throughout the event students played football with balls made especially for fairandfunky, in Pakistan. It was very exciting to know exactly where the balls were from, and who made them! With Nigel from Suma Wholefoods students played a game of ‘Un-fair football’ – the rules kept changing and it was only when the team played co-operatively together could they achieve success. Project Sport taught tricks for successful keepy-uppys and volunteers from Camira Fabrics held a ‘Beat The Banana Goalie’ competition! Successful goal scorers were rewarded with a fruit kebab thanks to Holmfirth Coop. Children all over the world play football, but not everyone is able to afford to buy their own, so what do they use? They make their own footballs using rubbish! Students had a go at making their own football from plastic bags, newspaper and string. They soon discovered how hard it was, and spent time thinking about how hard people work to make the footballs they’d all been playing with. It’s important that workers are paid fairly, especially when you consider the amount of money generated in playing football. It’s time to play fair. And that’s what all the schools who took part will be able to do. 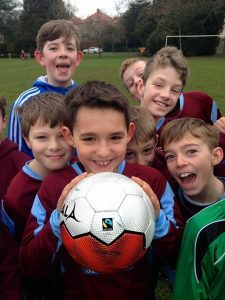 Thanks to sponsorship from Suma Wholefoods each school will be presented with Fairtrade footballs made especially for them – to play fair, and think fair. Burley Trojans under 10’s and their Bala football. Bradford Fairtrade Zone has been busy raising awareness of Bala Fairtrade footballs by presenting footballs to a local school and several football teams in the Wharfe and Aire valleys. Ilkley Town Veterans, Wharfedale Strollers walking footballers, Burley Trojans Under 10’s, Keighley walking footballers, and Burley and Woodhead Church of England Primary School made immediate use of their new footballs. Karen Palframan, chair of Bradford Fairtrade Zone, showed the Burley and Woodhead School Council the latest Fairtrade Foundation football resource for schools, which follows the manufacturing process of Bala footballs in Sialkot, Pakistan, where 70% of the world’s hand stitched footballs are produced. Sialkot produces some 40 million footballs in an average year! The children learned how Fairtrade helps to ensure that the workers are paid a fair wage, have safe working conditions and that there is no child labour. They also learned about some of the projects that the Bala workers have spent their Fairtrade premium funds on, which include eye tests and two community water filtration plants. The School Council decided to organise an assembly about Fairtrade footballs and will use this activity to help the school on its journey to gain full Fairtrade school status. 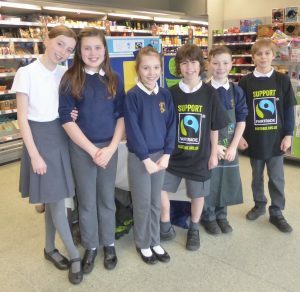 It gained ‘FairAware’ school status in January, and the staff have swapped over to using Fairtrade tea and coffee. During Fairtrade Fortnight, pre school children in Cherry Burton enjoyed their Fairtrade break. 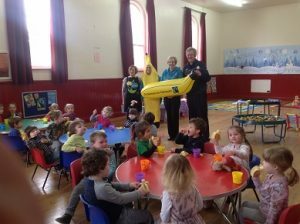 Ros Stanley, from Cherry Burton Fairtrade Village steering group, spoke to the children and pre-school leader Claire Newton dressed in a Fairtrade banana suit. Dave represented Tesco, who donated Fairtrade bananas for the break. 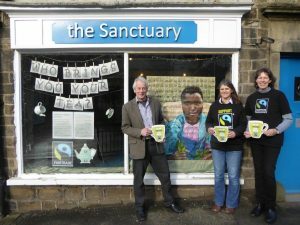 Baildon Co-op, Northgate, hosted a Fairtrade stall to display Fairtrade items on sale in the store. Customers were encouraged to try a different Fairtrade tea selected from Assam, Indian Prince and English Breakfast; all stocked by the Co-op. The manager, Mark Millman, has also made up a hamper of Fairtrade goods as the prize for a quiz open to all, the winner being announced at the end of the Fortnight. Six pupils from Baildon Church of England Primary School assisted on the stall during the afternoon, enthusiastically engaging people in conversations about Fairtrade and justice. They were also taken on a tour of the store to see what Fairtrade products were available and asked questions about why certain items were not Fairtrade certified. 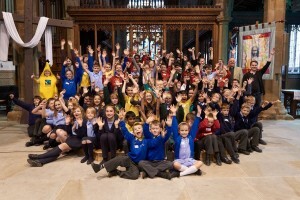 Their teacher, Mrs F Wilkinson, said that the children had enjoyed a stimulating afternoon. The school is working towards Fairtrade status and hosted a Fairtrade Coffee Morning on Friday 10th March for parents/carers of children in Year 5. The children had baked Fairtrade goodies, and were very keen to explain Fairtrade to the adults who attended. 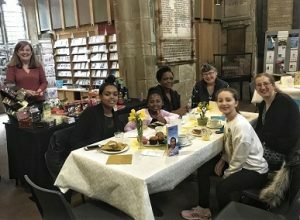 On Sunday March 5th, approximately 40 adults and children enjoyed a Fairtrade Breakfast at Bradford Cathedral, during Fairtrade Fortnight. their children to school. We enjoyed a breakfast that included Fairtrade muesli, jam, marmalade, chocolate spread, homemade muffins, tea, coffee, hot chocolate and orange juice. At the same time, we gave our support to local businesses by enjoying locally produced bread, butter, honey and milk. In the service that followed the Breakfast, the children led the prayers, ‘that those who teach about justice and trading in our schools may look for new ways to share their interest in breaking the cycle of poverty so that children will know about the need for fairness in trade’. Over the last few weeks, the Sanctuary team in Ilkley, including artist Barbara Macnish, have been pouring hours into preparing what we think may even be the world’s first piece of art painted on tea-bags! It was all done for love; we wanted to help thousands of people think about the people who really bring them their tea, and to consider choosing Fairtrade as a result. 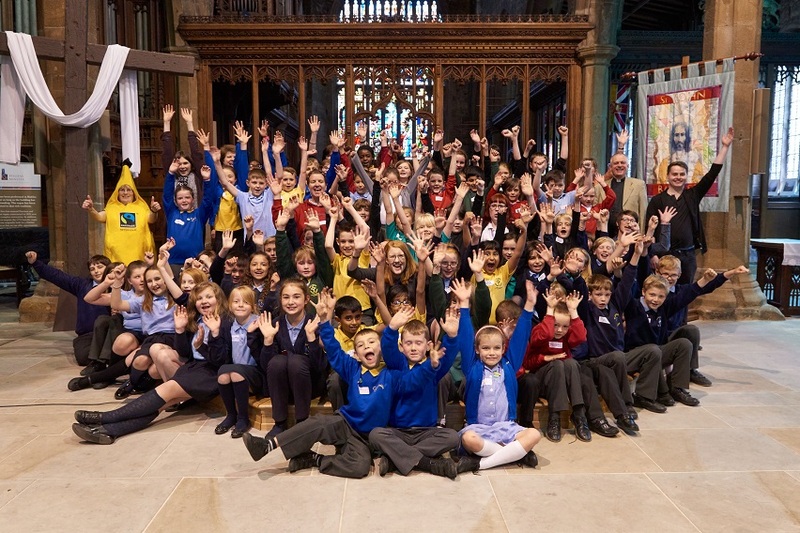 Halifax Minster opened its doors to school children from 9 schools across Halifax on Friday 13th May, to celebrate World Fairtrade Day at a fairandfunky Fairtrade Conference for Schools. Four different workshops invited delegates to ‘Stand up for farmers and be Agents of Change’ and students spent the day learning about Fairtrade and producers in Ghana, Columbia and Bolivia. With Pockets Theatre students used dramatic performance to explore the affect of supermarket price wars on banana producers. Each child took part in short role-play provoking an emotional response to Fairtrade; discovering the power of the consumer. In the fairandfunky workshop delegates were taken on a journey from bean to bar – discovering life as a cocoa farmer in Ghana and how important Fairtrade is to their community. Participants also learnt how to use ALL their senses to ‘taste’ delicious Divine Chocolate. With Liberation Nuts students learnt lots of interesting facts about nuts, the people who farm them, and discovered that Brazil nuts actually come from Bolivia! The conference closed with certificate presentations from Holly Lynch MP who encouraged delegates to continue taking their own little steps to change the world with Fairtrade. 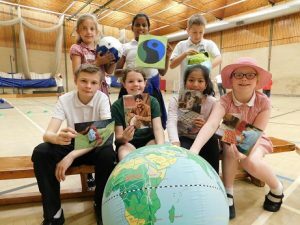 And each student AND teacher left with a Fairtrade goody bag filled with treats from Divine Chocolate, Tropical Wholefoods, Liberation Nuts and smoothies from Natural Beverages Comapany – aiming to keep Fairtrade conversations going back at school and at home. “An informative, enjoyable and interesting day, thank you!” Barkisland Primary School. The conference also links local businesses with Fairtrade, welcoming Suma Wholefoods as a Conference Partner, “We strongly believe in Fairtrade at Suma and we’re keen to help spread the word so were delighted with the opportunity to support the fairandfunky conference and educate the young of Calderdale.” Nigel Kaye, Co-op member at Suma Wholefoods. Faith leaders were leading the way at Leeds’ Merrion Centre on Thursday 3rd March with the holding of a Fairtrade breakfast. The Breakfast table looked very festive, with the banners and balloons and lots of shoppers paused to see what was going on. There was a display of Fairtrade items for sale from the local Morrisons and also a display of Fairtrade items from the Beehive, the local Fairtrade shop. 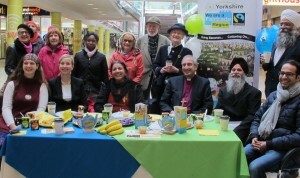 Leaders from all faiths in Leeds were invited. Amongst the attendees pictured are Bishop Paul Slater, Esther Hugenholtz, Krystal Holms, Gurmukh Singh, Usha Bhardwaj, Mr Birdi and Ashraf Hamad. It was lovely for everyone to mix and chat and at the same time have a grand breakfast. 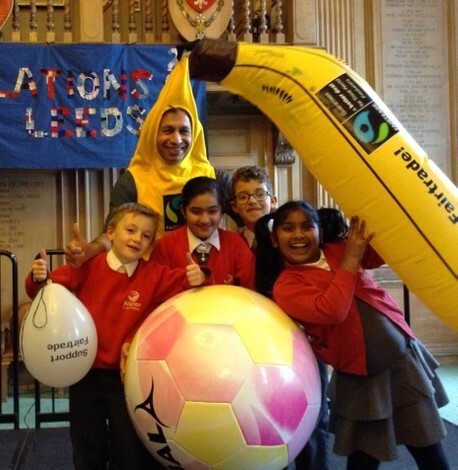 Children have also been taking a lead in Leeds. 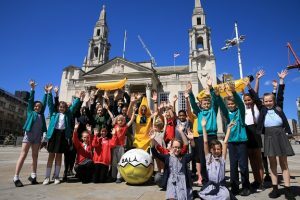 Schools from across West Yorkshire celebrated Fairtrade by designing and delivering their own workshops at a special event at Leeds Civic Hall on Friday March 4th. The event, organised by Leeds Development Education Centre and Fairtrade Leeds is part of a wider national programme which aims to raise awareness of the millions of farmers and workers struggling to feed themselves and their families, while supplying our breakfast tables with food and drink, such as bananas, cocoa and coffee. Fabian Hamilton MP presented schools with Global Learning Charter certificates, for work on valuing Global Learning within school. Greg Mulholland MP presented Bala footballs to students from local schools and then gave a short speech in which he encouraged local sports teams, such as Leeds Rhinos to use Fairtrade sports equipment. Greg congratulated Fairtrade as an organisation for branching out beyond food to other sustainable products, such as the Fairtrade footballs and Rugby balls. Last week Greg highlighted the importance of Fairtrade Fortnight in the House of Commons by tabling an Early Day Motion (EDM 1137) welcoming Fairtrade Fortnight 2016. “I really enjoyed attending this fantastic event, which was very well organised by Leeds Development Education Centre. It is important that young people especially are encouraged to learn about Fairtrade produce and where their food comes from. As the consumers of the future, they have the power to change Britain’s buying habits. 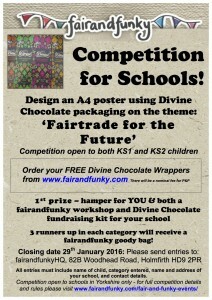 WIN a fairandfunky workshop and a Divine Chocolate Fundraising pack for your school! 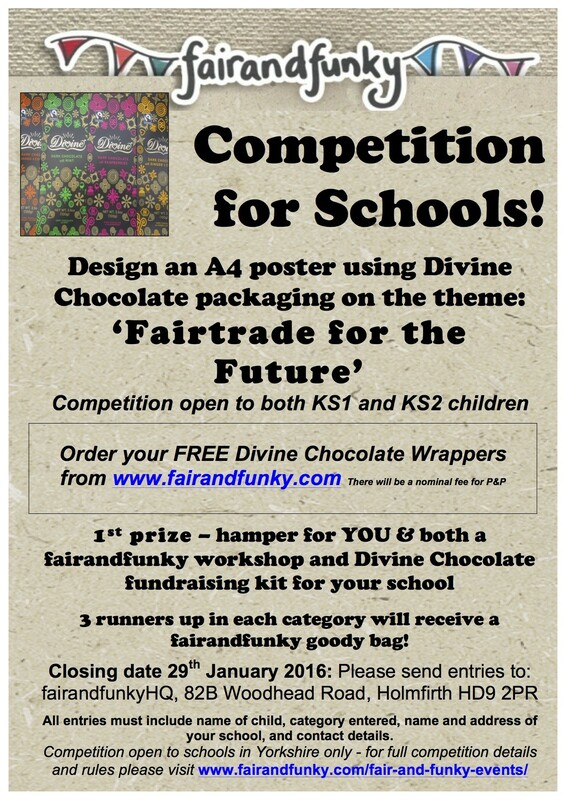 The winning design in each category (KS1 and KS2) will win a fairandfunky workshop, AND a Divine Chocolate fundraising kit, as well as a hamper for the individual artist. Each poster must include Divine Chocolate packaging. Packs including enough for a whole class to take part are available here: http://www.fairandfunky.com/fairtrade-online-shop/resources/ for a nominal postage fee. We look forward to seeing the winning designs. Good luck!